What an exciting time to come to The Rose! * State-of-the-art lighting upgrades will bring stories to life on stage more vividly and dynamically. Every single stage light has been replaced to utilize cutting-edge digital technology that makes our theater the most advanced performance space in the Midwest. * New and improved microphones and sound system will make it easier for audiences to hear and understand the action taking place on stage. * Updates to the Hitchcock Theater on The Rose's fourth floor make our FIRST STAGE shows even more inviting to first-time theatergoers. The space has been completely renovated with new flooring, seating, display spaces and more -- all designed to actively engage our youngest audience members. * A new digital marquee outside the theater not only showcases our upcoming productions with the latest technology, but also honors the history of our iconic building. What will never change is The Rose's ongoing commitment to providing high-quality family entertainment at an exceptional value. We look forward to serving you during the 2018-19 season! School is starting and Judy Moody hopes an exciting end-of-summer family vacation adventure on an island packed with legends of pirates and treasure hunts will make her the envy of her whole class. Based on the book series by Megan McDonald, this tale finds Judy and Stink in a race to win the Pirate Challenge. You absolutely CANNOT MISS this brand new stage adaptation! Back by popular demand! Featuring evocative music, innovative puppetry, and stunning black light visual effects, The Very Hungry Caterpillar follows the adventures of a very tiny and very hungry caterpillar that eats his way through an amazing variety of foods towards his eventual metamorphosis into a beautiful butterfly. His story is joined by Little Cloud as well as The Mixed Up Chameleon, making for an unforgettable theatrical event for the entire family. We know Rose Kids who love theater to death...but would you really DIE to be on stage? Brooke and Zeke just know they are going to be the leads in the next drama club production. But what’s up with that spooky script the theater director has chosen? And what about that creepy trap door that leads to tunnels below the stage? With such scary goings-on, will the show go on? Join the fright-filled fun—just in time for Halloween!—as the cast of “The Phantom of the Auditorium” tries to survive until Opening Night in this terrifying tale from the mind of R.L. Stine. We’ve heard of “Stage Fright!” but—SERIOUSLY, guys—this is ridiculous! Buddy the Elf has always been a little different. Even among his festive Christmas coworkers Buddy really stands...TALL! But when Buddy learns from Santa that he’s a human, the enormous former elf embarks on a quest to New York during the holidays to find his father. His upbeat, childlike cheer has a powerful effect on everyone he encounters! But will Buddy be able to charm his dad who long ago lost his seasonal spirit? This musical adaptation of the holiday film featuring Will Ferrell is one your family will definitely want on their Christmas Wish List! Steven's great-great grandfather Chief Standing Bear stood up in court and demanded that a federal Judge recognize that Indians are "persons" under the law. When Steven is bullied at school, Steven must follow in his grandfather's footsteps and speak out against his school's attempt to erase his identity. Written by Mary Kathryn Nagle (citizen of the Cherokee Nation), the play invites the audience to see the past emerging in our present, and ultimately what it means to truly stand for who we are. Witness a thrilling drama about a historic Omaha story with this world premiere production commissioned by The Rose Theater and developed at The Kennedy Center in Washington, D.C.
Nora is an imaginative little girl whose community faces a time of ethnic cleansing of Jews in Russia. When Nora's family is forced to flee to America, they discover at the last moment that they don't have enough funds to pay for everyone's passage. Young Nora will have to stay behind with a kind doll maker who offers to care for her until they can earn enough for her journey. Nora and the doll maker show that obstacles can be overcome with the help of good friends and community. Join Pooh, Piglet, Eeyore, and Christopher Robin’s other friends in this gentle adaptation of A.A. Milne’s classic stories. Winnie-The-Pooh spends his days searching for honey, doing his exercises, and playing with his best friends. When the group learns that a kangaroo will be moving into the forest, they plan to avoid this bouncy animal. But when they actually meet Kanga and her child Roo, they learn just how much fun new friends can be. Discover the dietary delights and dilemmas of DRAGONS in this fun-filled farce! In this hilarious adaptation of Adam Rubin’s giggle-generating book, we meet Boy—and his faithful fido, Leroy--as they wrestle with a particularly stubborn homework problem. When a sharp-suited spokesperson on the TV suddenly draws Boy and Leroy into a documentary about dragons and their favorite food: TACOS! Before long, they are swept up into the "Dos & Don’ts" of serving tasty treats to big beasts. Fortified with his new dragon knowledge, will Boy make a homework breakthrough? Come join the culinary quest and find out! Time Magazine’s “Best Show of the Year”. Tony® Award winner. Featuring the hit songs “Naughty” and “When I Grow Up”. Filled with high-energy dance numbers and showcasing Omaha’s most talented youth, Matilda is a joyous spectacle that will inspire the whole family! “All aboard!! !” for a brand new First Stage adaptation of the all-time classic children’s book! This new production brings Watty Piper’s timeless tale of perseverance and positivity to fresh new life for contemporary children! Watty and Piper are sisters who aren’t exactly on the same track. But when the train to Springfield is delayed leaving them stranded in the station, the sometimes squabbling siblings must learn to work together—with lots of help from children in the station to find a way to get toys and treats to the children on the other side of the mountain. With its universal themes of believing in yourself and helping others, you and your little ones will relish this ride on the rails of doing the right thing! Back by popular demand! Thumbelina is a flower-sized girl determined to discover the true meaning of friendship. Follow her on a magical, thumb-sized adventure that will find your child swimming with fish and flying with sparrows using inventive puppetry and innovative design. 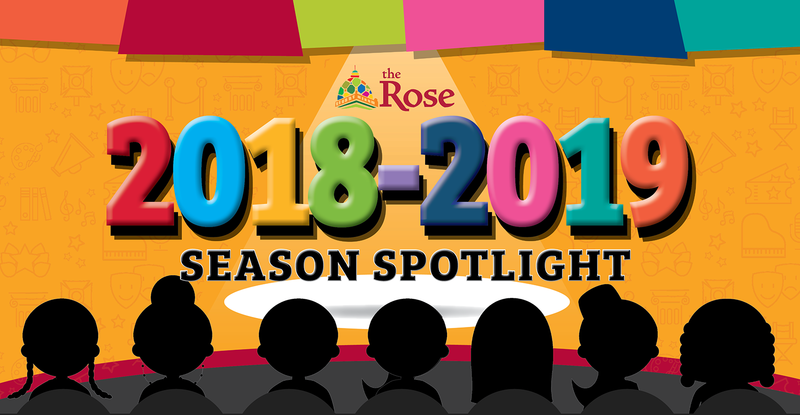 Rose members receive 4 FREE tickets to each of the seven regular season shows, plus discounts on premium shows and FIRST STAGE Pre-K series shows. MEMBERSHIPS ON SALE NOW! CLICK HERE TO PURCHASE YOUR 2018-19 MEMBERSHIP! An adaptation of the popular “Judy Moody” books and the story of a young Native American who fights to preserve his heritage are among the highlights of the 2018-19 season at the Rose Theater. Both are world premieres.